ull of ferocious fighting and colorful characters, The Atlanta Campaign was a series of battles fought in the Western Theater of the American Civil War throughout northwest Georgia and the Atlanta area during the summer of 1864. Union Maj. Gen. William T. Sherman invaded Georgia beginning in May 1864, with fierce opposition from Confederate general Joseph E. Johnston. As Johnston’s Army of Tennessee withdrew toward Atlanta in the face of Sherman’s armies, Confederate President Jefferson Davis replaced Johnston with the more aggressive John Bell Hood who furiously attacked the Union Army with a series of damaging frontal assaults. Hood’s army was eventually besieged in Atlanta and the city fell on September 2, setting the stage for Sherman’s infamous March to the Sea and an escalation of the devastation visited upon soldier and civilian alike. We will cover the entire campaign through our visits to Kennesaw Battlefield*, museums and cemeteries. We will tell the stories of the flesh-and-blood soldiers of both sides and the citizens of Atlanta who were caught up in the devastation of the War. Join us for a one-of-a-kind tour of the sites and sounds of the climatic fight for Atlanta. If you are a Georgian or Alabamian and you have not visited these places before, or you only visited them on your own, we encourage you to travel with historians who view the past with biblical and providential presuppositions, and who love to relate the stories of the men and women of the past, who deserve remembrance and who left lessons for us all. We will end in time to make the opening session at the Teach Them Diligently Homeschool Convention in Atlanta where Bill Potter will be speaking. Those desiring to attend will need to register separately through the Teach Them Diligently web site. Landmark Events made history come alive to our family! Loved the headsets, fellowship, all the venues and appreciated the ability to picnic each day. Thank you!” —Sarah M.
I liked the way you connected influences and events to indicate God’s Providence! We love the various, often little-known aspects of His Story!” —Genelle P.
oin Historian Bill Potter as he leads a tour of the best sites of the Civil War in Georgia’s capital. We will talk about what Russel Kirk called “the permanent things” that are worth fighting for and see the contrast with the modern political and social avatars of modernity and moral chaos. The men of the 1860s knew what they were fighting for on both sides of the line, praying to the same God as members of the same denominations, language and history. The Atlanta Campaign helped decide the outcome of the War Between the States. Fighting and maneuvering through North Georgia, Union General William Tecumseh Sherman and Confederate General Joseph E. Johnston fought a series of engagements that were both bloody and indecisive. At Kennesaw Mountain Sherman finally threw the whole weight of his veteran army against the entrenched Confederate line, both sides fighting to the death. His repulse only served to bring about the final slide past the Confederates, to cross the Chattahoochee River and attack Atlanta. The railroad, manufacturing, and communication center of the lower Confederacy withstood a siege from July 22nd to September 2nd, 1864 before General John Bell Hood took the Confederate army north into Tennessee and Sherman struck out for Savannah, burning a forty mile wide path through Georgia. Our tour will include a visit to the Marietta Museum where we can stand in the same room that the secret raiders stood as they planned to hijack the train to Chattanooga and destroy the bridges and tracks to bring about the capture of that city. (Hint: it was exciting, but it didn’t work). After a complete restoration, The Battle of Atlanta Cyclorama painting makes its exciting return in a new custom-built circular home at the Atlanta History Center. The painting was, at one time, the largest oil painting in the world, now restored to its original size of 49 feet tall and 371 feet in diameter! In addition to the Cyclorama, we will also be able to view the magnificent Civil War artifacts collection, explore historic Swan house, peruse the vintage Smith Farm and much more. We will also be able to view the magnificent Civil War artifacts collection as it relates to the entire war, but especially the Siege of Atlanta and the ordeal that changed Georgia history forever. The Atlanta History Center is the premier historical museum in Georgia, and perhaps the South. 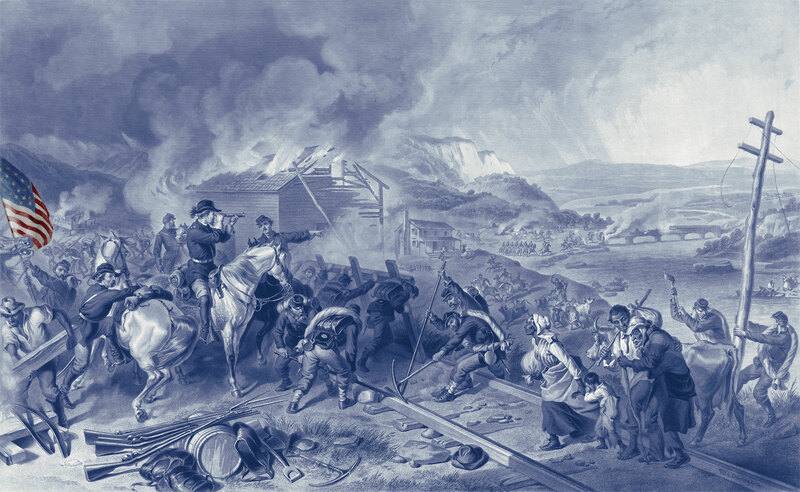 In June, 1864, the Northern Army of William T. Sherman had fought and maneuvered its way south from Chattanooga in a series of inconclusive bloody fights with Confederate forces under Joseph Johnston. Sherman shied away from high casualty frontal assaults until faced with the fortified mountain named Kennesaw. After multiple days of pouring rain, quagmires of mud, and skirmishes with Confederate troops Sherman decided to force the issue with an attack on a broad front against a numerically inferior and just as tired, enemy. The Confederates had their backs to the Chattahoochee River and Atlanta beyond; it was in some respects a last ditch defense while the city fortified and worried. We tour the bloodiest sector of the battlefield known as “the angle” in which Union troops in a forlorn hope climbed the slopes of the mountain and met a torrent of fire. The stories of the fight by survivors are as poignant as any in the entire war. The heroes of Illinois and Tennessee fought to the death for their countries; to actually walk the ground, to hear the stories and explore the woods, entrenchments and slopes of battle will inspire and sober everyone in appreciation and wonder at our God-ordained past. The town of Marietta witnessed a full measure of the War for Southern Independence. Confederate troops were trained there, the armies fought, and one of the most exciting events of the war began at the train station—The Great Train Chase. In 1862 a band of adventurous Union volunteers made their way to Marietta disguised as civilians—their leader, James Andrews, was not in the army but offered to lead the intrepid band of train thieves. The operation was all a part of a larger military effort against Chattanooga. The stolen train was to be used to cut communications, burn bridges and isolate the Queen City on the Tennessee River. We will tell the story in detail, of the chase that ensued, the near misses and ultimate failure of the enterprise, as well as the fate of the raiders themselves. We will gaze down from the same vantage point as the raiders, now in the Marietta Museum, along the railroad tracks. We will meet at the famous gazebo in the square and disperse for lunch in the storied town. The beautiful and historic cemetery in the heart of Atlanta belies the violence and war that brought some 6,900 Confederate soldiers (3,000 unknown), including four generals, to be buried there. It is also the sight from which General John Bell Hood watched the Battle of Atlanta. We will visit the gravesites of generals, privates, and civilians as well as have opportunity to photograph the Lion of Atlanta memorial to the Confederate soldiers who died defending the city or in the hospitals located near the burial ground. The obelisk marking the Confederate section was for many years the highest point in Atlanta. Among other luminaries of Atlanta history is the grave of Margaret Mitchell, the author of Gone With the Wind. The Capitol grounds play host to a number of monuments to Georgia politicians of yesteryear. We will do a quick survey of the monuments, pausing especially at those of Governor Joe Brown and Major General John B. Gordon—the only equestrian statue at the Capitol. Inside we will see the great portraits of the great constitutionalist and Vice-President of the Confederacy, Alexander Stephens as well as those of General Robert Toombs and Howell Cobb, the men who helped create the Confederacy. The heroic portrait of General Clement Evans reminds the legislators every day of their former bid for independence and their Christian past, even as they claw for more and more dependence on the federal government and bow to the depraved social agendas of big business. Needless to say, there aren’t any other tours like this one. We will cover the entire campaign through our visits to Kennesaw Battlefield, museums and cemeteries. 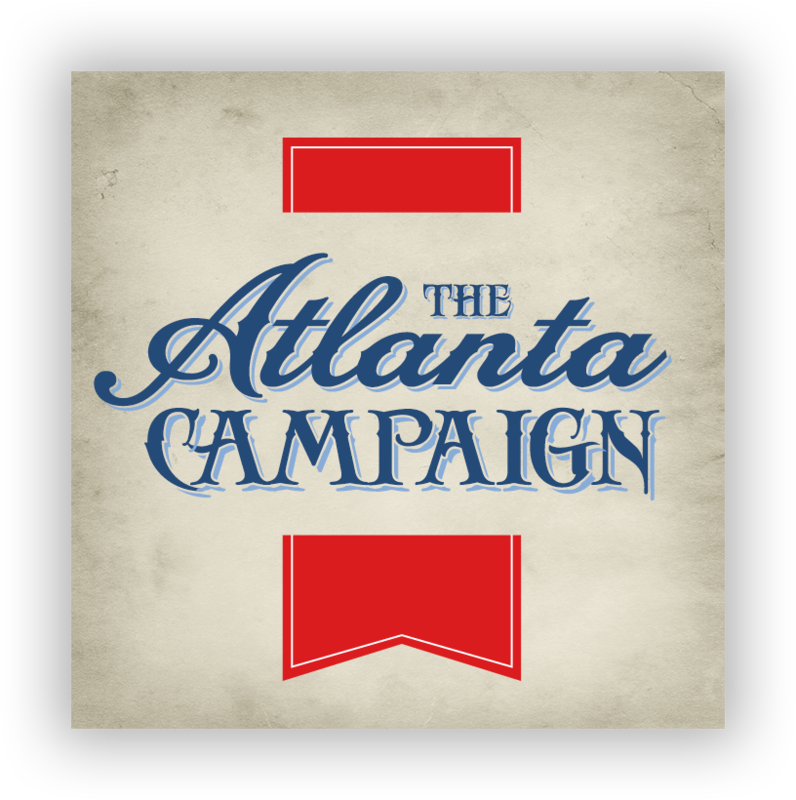 We will tell the stories of the flesh-and-blood soldiers of both sides and the citizens of Atlanta who were caught up in the devastation of the War. Join us for a one-of-a-kind tour of the sites and sounds of the climatic fight for Atlanta. If you are a Georgian or Alabamian and you have neglected visiting these places or you only visited them on your own, we encourage you to travel with historians who view the past from biblical and Providential presuppositions and love to relate the stories of the men and women of the past, who deserve remembrance and who left lessons for us all. I liked the fact that we could ride separately to the different venues. If we didn’t want to visit one, we didn’t have to. Or we could leave it early or stay longer. I liked the freedom we had to explore on our own or with the group. This tour went above and beyond my expectations. I can’t wait to participate in another one in the future.” —Carol R.
1.1 miles ≈ 5 mins. 9.4 miles ≈ 20 mins. 2 miles ≈ 10 mins. * Dinner is on your own, but not required. 3.1 miles ≈ 8 mins. 0.1 miles ≈ 1 min. 3:00pm Conclusion of Tour — Free to explore on your own. Note: Following the tour, Bill Potter will be speaking at the Teach Them Diligently homeschool convention in Atlanta. Those desiring to attend will need to register separately through the Teach Them Diligently web site. For those attending the Teach Them Diligently Conference at the Cobb Galleria, convention rates are available through the Teach Them Diligently web site. If you are coming just for the tour, there is a wide variety of accommodations throughout the Atlanta area. We suggest selecting one in the Cobb Galleria area as there is a variety of hotels with various levels of service and rates available.